Lillith's Grove is a shop dedicated to consistently providing high customer satisfaction by rendering excellent service, quality products and furnishing an enjoyable atmosphere at an acceptable price/value relationship. To supply products that enhance our customer's spiritual journey and magickal workings at affordable prices and provide a level of customer service that is unparalleled. Each artifact is awakened to its new life as a wand. Consecrated by the Goddess with the five elements - (earth, air, fire, water, and spirit), the wand is imbued by the invoking pentacle and annointed with charmed Moon water. During the enchantment, the magical core is meditatively inserted into the wand. The magickal core may consist of harvested magickal items and/or potions from the astral realm such as: pheonix feathers, faerie dust, unicorn hair, mermaid scale, or even dragon scale...etc according to the specific energies needed for the wand's correspondences. This enchantment prepares the wand to receive the impression of its new partner and create a working bond. In all cases, we suggest that a new owner perform his or her own blessing and consecration to seal the relationship between wand and user. After consecration is finished by the crafter, the wand is then placed on the Amethyst geode to provide a calm, tranquil aura for the wand so it will stay clear of negative and unbalanced energies until it is sent to it's new owner. Lillith's Grove started in 2001 when her inspiration for creatively crafting wands began. Originating in auction sales, Lillith has provided almost hundreds of customers with uniquely, hand-crafted wands, cleansed and charged for their bidding. 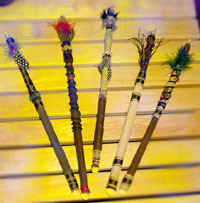 Many have requested her wands for festivals, wholesale, and custom made orders.